. . . breaking new ground in microscopy for the digital age. The Eclipse 80i is the culmination of Nikon's breakthroughs in optical technologies and precision engineering. After listening carefully to our customers, we have incorporated an array of optimal digital-imaging optics that ensure uniform brightness over the whole view field and offer superb resolution to the peripheries, taking digital imaging to new heights. 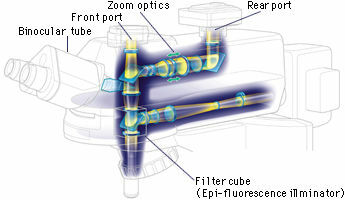 The digital imaging head and the universal epi-fluorescence illuminator incorporate Nikon's unique Hi S/N Fluorescence System. The Noise Terminator directs stray light out of the objective light-collection path, delivering a signal-to-noise (S/N) ratio five times that of our previous fluorescence system, increasing the image contrast during fluorescence microscopy and further extending the detection-level limit. Adjustments can be made by simply sliding the excitation balancer(below) back and forth. During observations or imaging of multi-stained specimens, the operator can easily emphasize the specific wavelength of the excitation light without changing the filter cubes. The spectral intensity of each excitation wavelength of the multi-band filter can be changed continuously by adjusting the sliding distance of the Excitation Balancer (option) into the optical path. B excitation is emphasized. Standard excitation UV excitation is emphasized. The filter turret can accommodate six, easily exchangeable filter cubes. The filters or mirror in the filter cubes can be easily replaced to create the desired combination. Phosphorescent filter labels are used on the turret cover, making it easy to see the names and positions of filter cubes in darkened rooms. Easy replacement of filter cubes Filter cube labels glow in the dark for easy identification. The composition of the material used in the DIC prism has been changed to make it possible to obtain high-contrast DIC images with excellent resolution and uniform coloration at any magnification. � Two types of new DIC modules (dry) cover observations at 10X-100X magnifications. � Three types of DIC prisms are available: standard, high-contrast and high-resolution. � The shade (3D effect) of the image can be adjusted on the rotatable-stage model. A revolutionary "fly-eye"� lens array has been incorporated into the transmitted-light illumination optics to achieve highly uniform illumination, making loss of light intensity at the peripheries of the view field a thing of the past. Uniform brightness is possible at all magnifications, while completely filling the objective back aperture. These objectives were specifically designed for digital-imaging applications that require optimal optical performance to images� periphery. They have exceptional resolution and image flatness throughout the view field, and shading has been eliminated by increasing light transmittance at the periphery. Images sharp to the edge of the view field are possible: Perfect for tiling images into specimen data. Chromatic aberration is corrected, even at the near UV range (405nm; h-line), making these objectives perfect for confocal microscopy. This all-in-one digital-imaging unit for taking high-contrast, crisp fluorescence images integrates Hi S/N epi-fluorescence illumination with the Noise Terminator, dual-port beam-splitting module with zoom optics and binocular-eyepiece tube. A "Motorized Excitation"� shutter control is provided. When the Nikon DS-5M-L1 digital camera is mounted on the digital-imaging head, imaging data such as the objectives, imaging port, zoom magnification and fluorescence filter selection are automatically detected and can be saved as a text file in the image folder or output to an external imaging system. This eliminates the need to input data manually. Creating a large database of images taken at different settings is now easier than ever. *Dedicated accessories and DS-5M-L1's software update are necessary. Save function is available soon. A 0.8X-2.0X optical-zoom mechanism at the rear port allows imaging at desired magnifications. Unlike digital zoom, optical zoom produces silky-smooth images, maximizing the total pixels of the CCD. Two output imaging ports allow a variety of imaging devices to be mounted simultaneously. The front port is perfect for confocal and quantitative measurement applications as minimum lenses are used. The objectives of Nikon's acclaimed CFI60 infinity optics have a 60mm parfocal distance, resulting in longer working distances and high N.A. 's, while producing crisp, clear images with high contrast and minimal flare. A flexible upgrade path is available to accommodate various intermediate modules. Utilizing computer-aided engineering (CAE), Nikon has significantly increased the stability of both the stage 'Z'� movement and the arm section compared with previous Eclipse models. 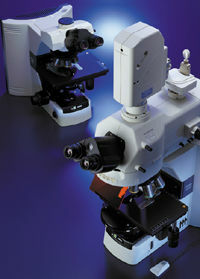 The increased stability minimizes the chance of the unwanted blur or image shifts that can occur during high-magnification observations. The superhard, smooth �Alumite� treatment applied to the stage surface ensures years of use. The handle of the new mechanical stage stays at a fixed position near the focusing knob throughout the full range of X/Y stage movement, so the operator's hand can remain comfortably on the desk at the same position. The height and tension of the stage handle are adjustable. The rotatable-stage model allows image documentation at the desired angle, improving composition. The contrast-shading angle of the DIC image is also adjustable. Tube can be inclined, while eyepieces can be extended. The new ergonomic binocular-eyepiece tube can be inclined at angles from 10� to 30� and the eyepieces can be extended up to 40mm. This ensures an optimum eye point and comfortable viewing posture, regardless of the operator's physique or if intermediate modules have been attached. The eye-level riser can raise the eye point height in 25mm increments (up to 100mm maximum). A C-mount digital camera can be attached to the ergonomic tube using the optional DSC port with a 0.7X magnification.